Most visitors to Macau come for a day-trip from neighboring Hong Kong. But one day is just not enough to properly experience Macau. With a history and culture of its own, there are many more things to explore than look at it merely as a casino capital of the world. Given below is a detailed itinerary of Macau. Day 1: Macau – Macau Historic Centre and Macau Museum: Arrive at Macau International Airport. Check into a hotel on arrival. Later go for a walking tour to the various monuments of Macau Historic Center, collectively classified as a UNESCO World Heritage site. This boasts of a number of temples, ruins and pastel-colored colonial buildings. Visitors can see a unique cultural fusion of Portuguese and Chinese architectural, religious and artistic styles. It is so interesting to spot Taoist temples by the side of a Christian Church. Ruins of St. Paul’s Church, though a little crowded, is a must see place for the visitors. 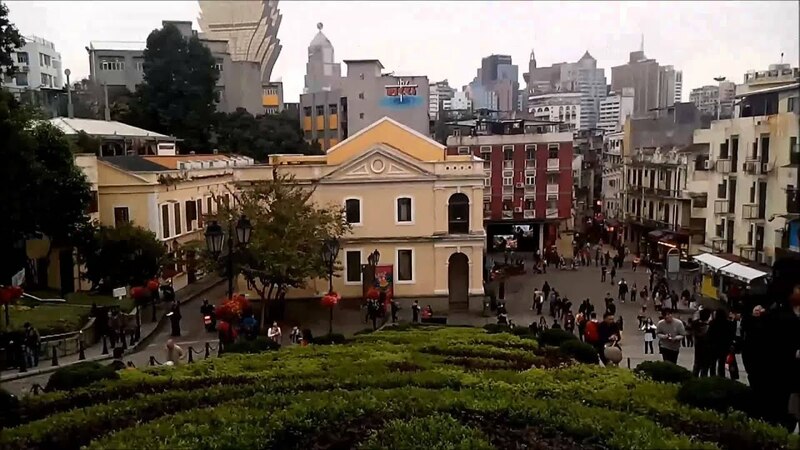 Relax with an afternoon coffee at Senado Square where groups of Macanese city dwellers have lived for centuries. Head over to Macau Museum after photographing the facade of St. Dominic’s Church. The Macau Museum has three levels of artifacts and information pertaining to the past, present and future of modern day Macau. Return to the hotel. Feast on the unique Macau cuisines and have an overnight rest. Day 2: Macau Peninsula, Coloane, Taipa & Cotai: After breakfast move to understand and enjoy the three islands of Macau – Coloane, Taipa and Cotai. They have now been connected to create one single large landmass. But the three islands have their own unique characters. Go for a walk on Coloane down Cheoc Van beach and walk along the streets of an authentic old fishing village. Have a little bit of Portuguese tarts in Coloane village. You can choose to skip breakfast at the hotel and have these tarts as breakfast. Move over to the neighboring Taipa for some nice drinks. Many casinos are based here. You can try hand on some games of your choice at these casinos. Later head to the infamous Cotai Strip, which is modeled around the Las Vegas Strip. The largest casino of Macau, Venetian Macao, is based here. Venetian Macao is the largest single-standing building in Asia when measured by volume. Attached to the casino is a 3,000 room hotel which also houses the 15,000 seat Cotai Arena. Many top performers frequently perform a live show here. Towards the evening, if interested, visitors can head to St. Augustine’s Square and visit St. Augustine’s Church. Enjoy your dinner at one the restaurants. Head straight to the bed after a long day out. Day 3: Luis de Camoes Grottos and Gardens, Macau Tower, House of Dancing Water show: Start with a morning walk at Camoes Gardens, Macau’s largest park and a popular venue for locals to perform their morning exercise routines. Afterward move to visit Macau Tower, which offers arguably the best view of the entire city. Visitors can choose to ascend glass-fronted doors to the 58th floor observation deck, or be a bit more ambitious and walk on the outside of the tower. Visit Lilau , which was built around the natural spring which used to provide fresh water to Macau’s people, back in the old colonial days under Portuguese. The small stone-paved streets around the square are full of old days charm including some heritage buildings. A few minutes’ walk from there is A-Ma Temple and Macau Maritime Museum. St. Lawrence Church is also nearby. Head back down to Cotai again for an evening performance of the “House of Dancing Water” show at the City of Dreams Casino. The “House of Dancing Water”, easily one of the best shows offered on the Macau peninsula, incorporates a huge pool – the size of five Olympic swimming pools. The show involves art of lighting and use of hypnotic costumes by the performers. Day 4: Macau – Onward Destination: After breakfast, if time permits go for shopping at San Man Lo (Avenida de Almeida Ribeiro) or Rua da Felicidade (Red House) Business Circle. Later on move to international airport to catch your flight for onward destination.